Stampin’ Up! have two amazing offers for you to celebrate the 25th Anniversary this October! The first one is hosting a party or placing an order with a total sales of $400 (ex gst) and receiving not only $60 of free product, but you choose a further $25 of free product. Yes you heard it, a total of $85 in free product of your choice from the catalogues! The 2nd amazing offer I will release to you on Friday. All I can say is, if you have a slight interest in joining, you must stay tuned for this incredible offer. Call, email or message me to find out more. 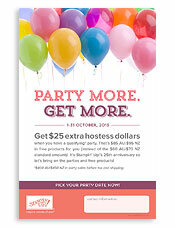 Tagged free product, Hostess Dollars, Party, Stampin' Up!